Generates thumbnails for the product images. Downloads the image from the provided URL in the CSV file to the server of your store. Re-uses product images from the Media Library. The URL of each product image must be entered in the CSV file which is to be uploaded. For importing multiple images of a product, the URLs are separated by the vertical line character ‘|’. During import, the first image is taken as the Product image and te rest of the images are added into the Product gallery. Now, let us get an understanding of importing a CSV file containing products with images. Note: Click Sample CSV of importing Images to download it. The plugin generates thumbnails for products by using the URL of the image which is specified in the CSV file. 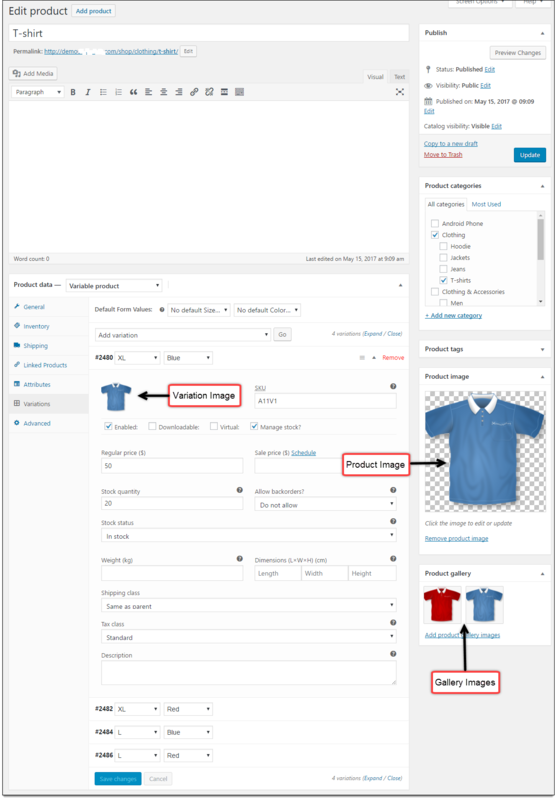 From the above screenshot, we can see the variable product – T-Shirt, is imported to the WooCommerce store with four variations. The respective product image, gallery images, and product variation images are successfully imported with thumbnails. Note: All the imported images are uploaded to the server of your store from the mentioned URL in your CSV. Make sure the image URLs are correct. If the images are already present in your WordPress Media Gallery, you can re-use the images. Read more about this process in the below section. To overcome this, you can provide the respective image name (image-name.jpg) instead of the URL. That is, keep the URL once in the images column, and for the subsequent use of the same image, provide only the image name in the column. Though this is pretty straightforward in the case of simple products, it can get a bit tricky in the case of variable products. For example, we have iPhone as a variable product on our store. Based on the attribute “color”, there are two variations: Black and White, which need different images. We have another attribute “storage”, which again creates three variations (16GB, 32Gb, 64GB), but can use the same image. In this example, we used the same image for variations Black 16GB, Black 32GB, and Black 64GB. Now you can see (above screenshot), we have used the URL only once for the Black variations. Whenever it is repeated in the CSV, we added the image name. And when a different image is used (for the white variations), we added the URL once and just the image-name.jpg in subsequent cases. For more information on importing and exporting of products, read our setting-up documentation. I have uploaded all my images and set a proper alt and title tag in the media libary. Now when I import (with just the jpg file name without full url) it does create another image in the media libary. The image created during the import has the same file name but it adds “1” at the end of the image title. So I dont have more files – but I do have duplicates items in the media libary. If you are trying to link an image that is already present in the media library to products thumbnail will be regenerated in the media library. So when you upload an image via CSV, an entry of the image for the product is added to the media library resulting in the duplication of the image. However, the images are not duplicated on the server. Is there any way to serve the image from external server and not import to media library. Because I saw some site have their image not on the local server. I am trying to import but your tool doesn’t include meta:_purchase_note ( I assume this maps to postmeta table ) Did I miss something in the documentation, or is this legitimately not there? You can import purchase notes by specifying the data in the meta:_purchase_note column of CSV. To include the purchase notes in the exported CSV you may please enable the option include hidden metadata during export. Can you also upload images from the same location as the SFTP where the import file resides? Basically we have the testimport.csv file in the root folder of the FTP and another folder named /images. Can the upload be done in that way? If you have the image URLs in the CSV, it will be fetched from the location and added to the product, as long as the URLs are accessible. If you are keeping only the image file names in the CSV, kindly keep the images somewhere inside the directory /wp-content/uploads/. Hi. I need to upload a few thousands of products and images for them on the site. Images are stored on my PC – there are not any of them on the Internet, so I can’t use the URL method to upload them. What is the quickest way to add them to the products? As I read here, there is a oppotunity to use only the name of the images, whithout URL. So as “Veeresh” answered earlyer, I need to upload images to Media Library and just use the name of the image to import. But I try import a few images from the Media Library that I upload manualy earlyer and it’s did’t work. It worked only when I used URL once in the images column. But I can’t mantion URLs of all my images – they all are different. So – can I use images names for uploading whithout mantioning any URL? I mean, by using only names in the images column. If not, how I should upload thousands of different images? Just as mentioned in the other reply, you can upload the images to the media library and just specify their correct image file name (eg: filename.jpg) in the images column in the CSV and import it. Images will connect with the corresponding products if the image with the filename specified exists in the media library. You don’t have to specify their URL. Please reach us via support if you still have issues. I desided to try upload old images from the Library again and add them names to images colomn, and it works. Thank you for answering and good working plugin. How is the url created – this is where I am stuck ? The image files are on my pc, what url do I create ? If you want to use images which are saved on your PC, you need to upload images to Woocommerce Media Library and just use the name of the image to import. If the image is on another server, you need to use full URL of the image to pull Image to your site. 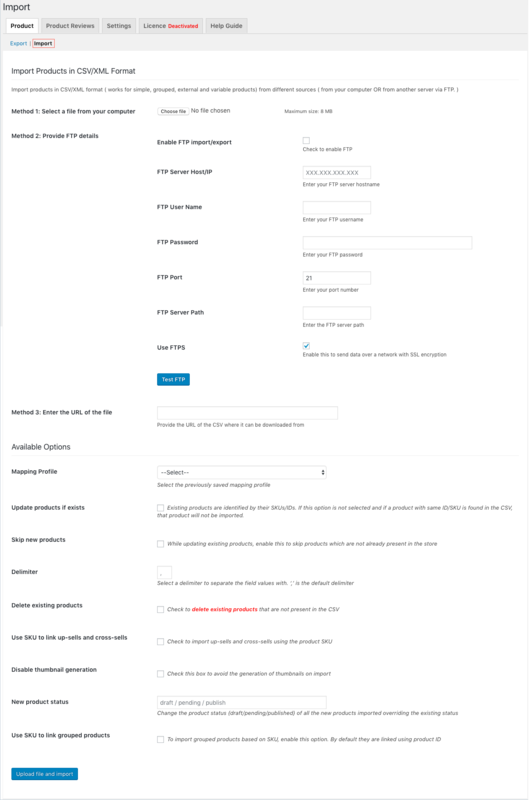 Can you explain me why do I need a plugin to import products and images when WordPress already has the function ? Is it better to use this plugin ? Our import export plugin has distinct advantages over the wordpress import feature. 1. Our plugin helps you to import products from any platform and export them to any platform via csv. 2. You can schedule the imports or exports to your remote location via FTP. 3. The Import/Export can be seamlessly done by mapping the fields of your external system with that of woocommerce. 4. It is simpler than the existing wordpress import. 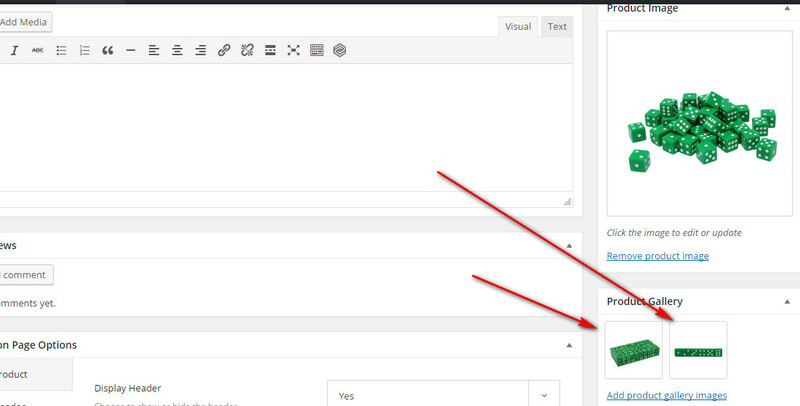 The wordpress import feature allows you to download the data in XML format. We do it in csv which makes it simple to view and edit. You can import multiple images for a product, separate URLs with ‘|’. During import, the first image is taken as the Product Image and rest of the images are added into Product Gallery. Thanks! But my question was if I can just put de name of a file that is already uploaded in the media library. It is possible just to put the image name of a media uploaded before in WordPress? For example, If I uploaded a image with the name “image-product.jpg” before in the media library. Can I put in the .csv “image product.jpg|http://other-url.com/image” ? Thanks! You can put the image URL in the CSV for importing . Hope that answered your query. While importing multiple images for a product, , separate URLs with ‘|’. Also, during import, the first image is taken as the Product Image and rest of the images are added into Product Gallery.